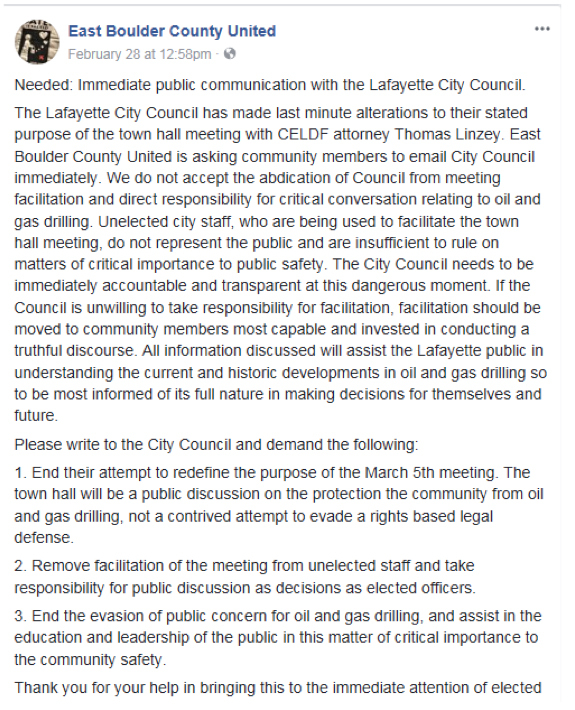 Tonight, representatives from the national ban-fracking group Community Environmental Legal Defense Fund (CELDF) will be presenting to residents of the city of Lafayette and answering questions about their offer to represent the city during a possible legal fight to ban oil and gas development in the town. CELDF’s founder Thomas Linzey will push his anti-fracking agenda at the forum as he attempts to convince residents to accept CELDF’s offer to represent the city pro-bono if they decide to use the recently passed “Climate Bill of Rights” as justification to ban drilling. If they do decide to move forward with this option they will need a legal defense because the Colorado State Supreme Court has routinely struck down local bans. It’s rare to see CELDF in Lafayette representing the national chapter rather than as its local front group, Colorado Community Rights Network (COCRN). COCRN, CELDF’s Colorado arm, has taken action in the past in some dramatic ways, like crashing Democratic Governor John Hickenlooper’s book presentation and using other extreme tactics such as calling on activists to “fill up jails” and even threatening communities with bankruptcy. With most of COCRN’s actions being a flop, it’s clear that CELDF has found a new friend in the “Wrong Door” anti-fracking activists East Boulder County United (EBCU), as they are listed on the CELDF website as a key source from which to “learn more.” Interestingly enough, EBCU had a lot to say about a recent change of format to tonight’s forum, expressing extreme displeasure with the fact that elected officials, the Lafayette city councilmembers, have taken themselves out of the hot seat and will instead seek shelter in the audience. With a lot of moving parts on the local level here, it’s important to remember that all of this is organized and facilitated by national ban-fracking groups like CELDF who are not based in the communities they target. Bringing forward controversial cases without merit is nothing new for CELDF—they’ve developed quite the track record in Pennsylvania and Ohio of forcing anti-fracking measures on local ballots—where they are frequently defeated—and raking up huge bills for these towns when they fight the measures in court. Ahead of today’s meeting, representatives from CELDF replied in writing to questions posed by the city administrator and attorney. Their answers made clear that, while CEDLF is offering free representation, that does not mean Lafayette won’t bear the cost of their actions. Here are the top four things you need to know about CELDF’s . While CELDF is offering to cover all the legal expenses related to defending the “Climate Bill of Rights,” they make clear that is where their generosity ends. “The City, not CELDF, would be responsible for any judgments, fee awards, sanctions or other costs imposed on the City by the Court,” they write. Lafayette is also responsible for “expenses for administrative costs associated with the case, and the costs for travel and other miscellaneous expenses associated with our representation.” Even if successful with the specific case at hand, CELDF will not be required to support the city in any ensuing litigation that results from the decision. As the city’s attorney pointed out, a successful verdict on the Climate Bill of Rights issue will most assuredly lead to additional lawsuits “for inverse condemnation of mineral rights.” Under the proposed agreement, those suits would be the sole responsibility of the city to defend. As already mentioned, the Colorado Supreme Court has ruled against local bans, so it is unlikely the state’s court system will change course and accept CELDF’s argument that a Climate Bill of Rights allows Lafayette to ban oil and gas operations. But this would not be the first time CELDF has brought forward a case that had little hope of success in the courtroom. Lafayette’s attorney asked the group which cases they have brought which achieved “successful result and your legal theory was endorsed by the trial court, and upheld by the appellate court?” Instead of running through examples of high profile wins or successes, CELDF effectively didn’t have an answer. They rattled off a generic answer about process that starts off with “CELDF rarely files actions on behalf of its municipal or other clients. Lafayette’s representatives also asked CELDF about their failed litigation in Pennsylvania where the group was actually ordered to pay the costs of their opponents due to their recklessness in bringing the case forward. The judge sanctioned CELDF’s lawyers due to their “bad faith” efforts to impose an injection well ban based on an “implausible” legal theory and “frivolous” and “discredited arguments.” The judge had ruled that “the advancement of a legal theory around the right of local, community self-government was frivolous, because it had been advanced previously by CELDF in other cases, where it had been unsuccessful.” With the Colorado Supreme Court ruling, we can expect more of the same. Even more telling, CELDF did not agree to withhold “derogatory statements” about the city should Lafayette decide to settle the case or discontinue proceedings. When asked, CELDF simply responded, “As a matter of professional ethics, CELDF is required to discontinue or settle litigation if the City decides, as the client, to do so.” As we’ve seen in the past, CELDF isn’t shy when it comes to voicing their opinion about cities who do not agree to move forward with their reckless strategies. Instead of being a serious legal operation, CELDF is more focused on using litigation to drive conversation, regardless of the cost that these irresponsible cases can bring on municipalities and taxpayers. Don’t take our word for it, take theirs. Lafayette, do they have your attention? Bottom Line: Lafayette is merely the latest victim of CELDF’s aggressive and irresponsible legal strategy. While the group is nominally offering their services for free, it’s clear that Lafayette will still be facing immense costs, regardless of the decision reached in court. If Lafayette’s leaders were responsible, they would turn down CELDF’s offer before they meet the same fate as Youngstown or Broadview Heights.